"Carasau bread" (from carasare, the Sardinian term to indicate to toast) or “Music paper” (for its noise in chewing), keeps the true essence of Sardinia. It is already known everywhere, and visiting Sardinia it’s simple to fall down to its way of showing and its unique and original taste, so the typical Sardinian bread, sooner or later ends up on the tables of many tourists that annually visit the island. Its taste is unforgettable. Infact most people don’t lose the opportunity to taste it again looking for it in the best places and in restaurants that offer with pride this typical bread which is made in the most inner territories of the region, that is in Barbagia area. It is considered one of the most ancient breads and its typical round flat pastry (that is the shape of the shoulder pocket of the shepherds), very thin and crunchy, reminds to the first types of bread in the territories of Jesus Palestine. Carasau bread is the shepherds bread because it can be kept for long. Infact pastoralism forced men to spend a lot of days far from home in order to graze the flocks and their wives found a light bread, nourishing, easy to maintain and long lasting, made just using durum wheat and water. 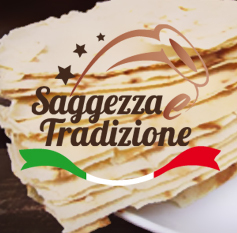 Exactly in these places, where one of the most ancient and best breads of the world was born, “Saggezza e Tradizione” selected for you the best Carasau bread, made in ancient ways and respecting the best tradition.